Bosch's gasoline direct injection will remain a coveted component. Certain engine component suppliers are going to make a very large pile of money off those new federal CAFE standards, according to industry forecasters. And we're not talking about all those producers of lithium ion batteries. Rather, it is the suppliers of gasoline direct injection, stop-start systems, advanced transmissions, variable valve technology and turbochargers. In their five-year forecasts for those technologies, J.D. Power and Associates and IHS Automotive agree on the trend. Gasoline direct injection will be used in 38 percent of all light vehicles produced in North America in 2016, up from 9 percent this year, IHS Automotive predicts. J.D. Power expects a 25 percent market share in 2015. 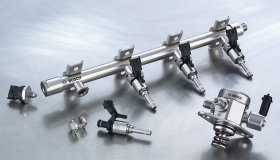 Nearly 90 percent of vehicles produced in North America will feature variable valve technology by 2016, up from 71 percent this year, according to IHS. And turbochargers will grow to either 12 percent of the market (IHS) or 25 percent (J.D. Power), up from 1 or 2 percent today. Gearbox suppliers such as ZF and Aisin should expect lots of orders. Meanwhile, turbocharger producers such as BorgWarner, Honeywell and Mitsubishi Heavy Industries will have a slugfest for market share. And keep your eye on Bosch and Continental, which offer gasoline direct injection. The bottom line: Despite all that loose talk about EVs and plug-ins, the real game may be steady, incremental improvements in gasoline-powered vehicles.